A battle is brewing in Scotland's southern uplands between two rival villages which both claim to be the highest in the country.Perhaps surprisingly, the highest village in Scotland is not in the Highlands but has officially been Wanlockhead in southern Scotland and it has got a sign to prove it.But if you carry on along the road that winds through the village and over the brow of the hill, you will reach another village, Leadhills.Its residents are convinced it is higher than Wanlockhead. And for people in the village that would be a great selling point, says Lee Gilmore, the woman behind the Teddy Bear shop in Leadhills. "In the summer we have a lot of tourists pass through," she says. "We don't want them to pass through, we want them to stop." Ms Gilmore says; "We are convinced we are the highest. 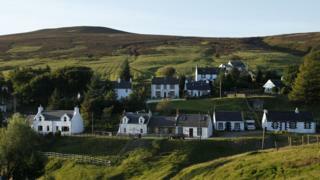 It's a kind of sibling rivalry"Wanlockhead is the sister village of Leadhills and they do everything together. "The only dispute we ever have is about who is the highest village. "To solve this sibling dispute, BBC Radio Four's More or Less called in Steve Cussell, an Ordnance Survey field surveyor based in nearby Dumfries. Mr Cussell took his kit to Leadhills first.It reads GPS satellites in orbit around the earth to measure the altitude at any point on the ground.He says the obvious place to start is by finding the centre of the village. That is not too hard.Resident Cameron Halfpenny takes us to the fire station, the hotel and the village shop. "This is downtown Leadhills. This is where it all happens!" he says.It registers at 394.7m (1,295ft) above mean sea level. But looking around the village there are some houses on the hill that are much higher than the centre point and then the road slopes down to houses much lower down.Mr Cussell says another way of measuring could be to take the highest and lowest point of the village and get an average. The highest house is 429.9m above mean sea level (1,410ft).Down the hill, following a stream which will later become the River Clyde, the lowest house in Leadhills is 369.3m (1,212ft). Next to Wanlockhead. It is only short distance away but when we get there it really does feel very different. The houses perch precariously on steep hillsides either side of a deep valley, carved by the Wanlock water that cuts through the village. The centre of the village is 405.6m (1,331ft) above mean sea level, almost 11 metres higher than Leadhills.But Cameron Halfpenny insists on measuring the average height so we trek up the hill to the highest house in Wanlockhead and, it is claimed, in all of Scotland. We then take the lowest house in Wanlockhead and the average is 393m, lower than Leadhills.But there is a problem.On a map it is the lowest house but it feels a long way from the village. "It is about a 10-minute walk down the valley from the main part of the village," says Cameron Halfpenny.Steve Cussell decides to rule out this measurement and sets out to find another house closer to the main cluster in the village. While Wanlockhead is the highest village in Scotland, it is not the loftiest in the UK.A village called Flash in England's Peak District, near the town of Buxton, is 463m (1,519ft) above mean sea level.In turn, it is positively lowland compared to La Rinconada in the Peruvian Andes, which is 5,100m (16,700 ft) above sea level, about three times the height of the UK's highest mountain Ben Nevis.To hear more on this story, listen to the More or Less podcast.More or Less is the podcast that explains and often debunks the numbers in the news. The new series starts on BBC Radio 4 on Friday 26 April.